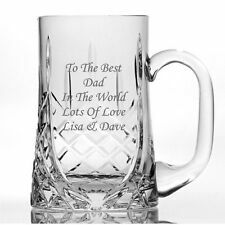 We can Laser Engrave your Tankard with up to4 Lines of text and 20 Characters per line, Including spaces and punctuation. At GiftCookie we specialise in providing quality personalised gifts at affordable prices for a variety of special occasions. HOLSTEN EXPORT. 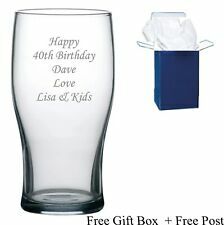 2 PINT GLASS. Home bar, man cave item. Novelty gift. In very good condition. Will be very well packed and posted quickly. FREE UK P&P. Extra Tall Pint Glass. At No Extra Cost. Once engraved mistakes cannot be corrected. We will only ask ONCE. 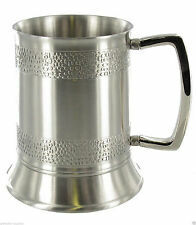 English pewter tankard. 1/2 pint (more than 1/2 pint is 300 ). 11 cm Base Top 8.5 cm and inside top 7 cm and 11 cm tall approx. Cosmic Gifts have been established for over 25 years. Providing new and unique gift solutions for any event. Supplied in a coordinating presentation box. BACK TO SCHOOL. RETRO GIFTS. BAD TASTE BEARS. Each of the 4 tankards boasting a striking 'flying grouse'. Fab set of 4 x Retro glass tankards with handles ~ Mid Centuy c1950s/60s. 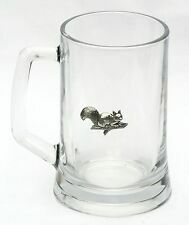 Super rare Grouse tankard set. Made in England. Glass detail tankard 'grooves' to the lower part of each glass. 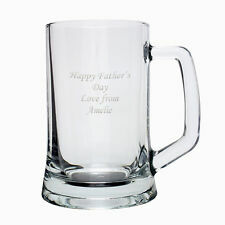 San Miguel Pilsener Crystal Beer Mug. This is a stunning German style beer stein from Switzerland, decorated with Swiss mountain scenes painted in bright colours on a cobalt blue glazed finish background. On one side there is a 3D scene of a lady carrying a basket, a mountain in the background, flowers in the foreground in the middle and on the other side a man blowing a alpine horn. EPNS Hard Soldered. Made in Blackpool England. We are here to help to resolve any issue. 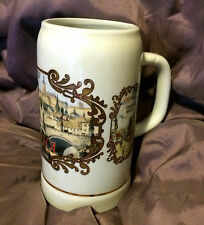 This little beer stein is very attractive and is in excellent used condition. It has an embossed design and features a river and boat scene. Item in very good used condition. 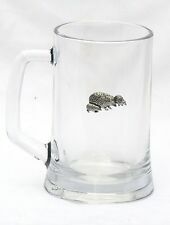 Pint Tankard Glass - Unused - Made in England. 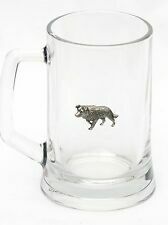 VINTAGE HOFMEISTER LAGER PINT GLASS WITH CROWN STAMP.